Bastille Day in Paris: Celebrating the World of Josephine Baker: A Life of ‘Le Jazz Hot’! “Americans in Paris: Ned Rorem and the Spirit of France” – This project is funded in part by an award from the National Endowment for the Arts. 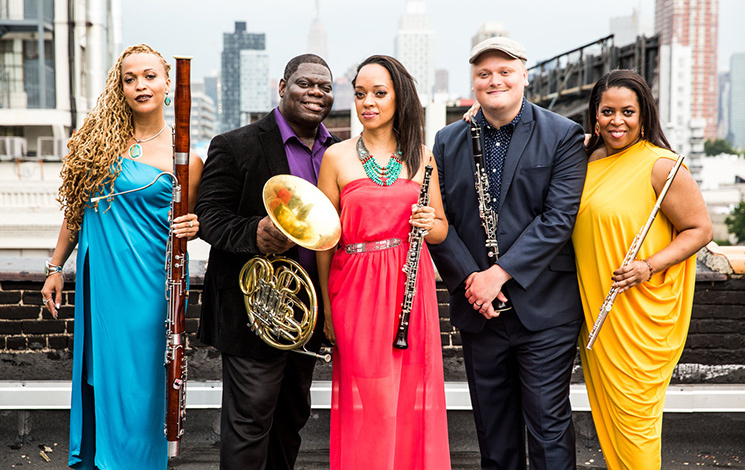 Imani Winds, formed in New York in 1997, have rapidly become one of the most admired and wide-ranging such groups in the country. Its original members were all of African-American or Latin American heritage, and their performances, many of which include music composed or arranged by the players themselves, range widely over classical, folk music and jazz. They have performed in halls and festivals all over the United States, and have also toured in Europe, China, Brazil, and Australia. The quintet is especially keen about music education, and its members have tutored extensively; currently Imani is quintet in residence at the University of Chicago. Their name, from Swahili, means “faith,” which is what they keep. Toyin Spellman-Diaz, oboe, graduated from Oberlin with a bachelor’s degree before receiving her master’s at the Manhattan School of Music. Toyin has played for and with many major symphony orchestras and teaches at Brooklyn College. Jeff Scott, horn, started playing at fourteen, and has a bachelor’s degree from the Manhattan School of Music and a master’s from SUNY Stony Brook. He has also played with several orchestras and is one of the two composer-arrangers in the group. Jeff is on the faculty at Montclair State University in New Jersey. Mark Dover, clarinet, is heavily involved in jazz as well as classics. He is also a Manhattan School of Music graduate, and he played with several symphony orchestras before joining Imani in 2016. Monica Ellis, bassoon, was a founding member of the group. Another Oberlin alum, she holds a master’s from Juilliard. She is on the faculty at Mannes and Brooklyn College, and also works with Juilliard’s musical advancement program for multiracial children. Flautist Valerie Coleman, another Imani founding member and composer-arranger, recently left the group, and her successor is Julietta Curenton, a celebrated freelancer who has played with a number of orchestras, including the Orpheus Chamber Orchestra and the New York Philharmonic, where she is currently a Teaching Artist. A Juilliard graduate, Julietta is equally at home in classics and jazz, and is committed to the musical education of inner-city youth. Andrew Russo brings a highly unusual combination of skills to Maverick. Not only is he a preeminent pianist, but he also works as a certified financial planner and adviser, and has even been a political candidate: In 2010 he ran, unsuccessfully, as a Republican candidate for a state senate seat in central New York. Born in Syracuse, Andrew studied piano in New York and later (with Frederic Chiu) in Europe. He is a noted interpreter of contemporary music, and his recording of music by John Corigliano was a Grammy nominee. The program begins with two pieces by Imani members. Startin’ Sumthin’ is Jeff Scott’s witty tribute to ragtime. He has beautifully caught the catchy off-rhythms of classic ragtime music, of the kind that makes an audience’s feet twitch—and Maverick is noted for its moving feet! Valerie Coleman’s Portraits of Josephine suite is her admiring tribute to the great Josephine Baker, showing what an extraordinary woman she was, far beyond the black legend who took Paris by storm in the 1920s and 1930s. Often unrecognized as such because of her stardom, she was a fiercely progressive thinker who dedicated her life to breaking down racial and religious barriers; she aided the French Resistance against the Nazis in World War Two, and in later life extended her struggle for civil rights around the world. The suite has seven movements, of which Imani is playing four today. The first, “St. Louis 1920,” portrays the young Josephine growing up in a city with a proud jazz legacy. “Les Milandes” is a brief tone poem about a French chateau which Baker hoped to transform into a school where her “rainbow tribe,” as she called them, would live and learn together in racial and religious harmony. Despite her strenuous efforts, she was not able to maintain the chateau or her dream. The next movement, “Paris 1925,” shows Baker when she was the toast of the city, with her personification of le Jazz Hot. It includes a clarinet solo in the style of jazz great Sidney Bechet, and a passage in the rhythm of the Charleston, her token dance. The last movement, “Thank You, Josephine,” is an arrangement of one of her iconic numbers, “J’ai Deux Amours,” which told of her love for her own country, as well as for her chosen city. It exemplifies the vitality and idealism of a great human being. Paquito D’Rivera is a native of Cuba who founded two groups in his native land that created a fusion of jazz, rock, and classical with native Cuban rhythms. He defected to the United States in 1981, and his Aires Tropicales was written a dozen years later, on commission from the Aspen Wind Quintet. It is regarded as a staple of contemporary wind quintet literature, incorporating Latin rhythms and melodies into a classical format. Two movements from the seven-movement work are heard today: the introductory Alborado, which means “morning song,” and Son, the longest movement, which has a bouncy bass line underpinning several typical Latin melodies. Lalo Schifrin was born into a musical family in Buenos Aires. He studied at the university there, then went on to Paris, where he studied with Charles Koechlin and Olivier Messiaen and played jazz piano at night to pay the bills. He played with Dizzy Gillespie in New York before moving on to Hollywood in 1963. There he achieved eminence as the composer of dozens of celebrated film and TV scores, including, notably, Bullitt and Mission: Impossible. Schifrin has won five Grammy Awards, one Emmy Award, and six Academy Award nominations, and he has a star on the Hollywood Walk of Fame. His La Nouvelle Orléans was written for the Dorian Wind Quintet. It is a picturesque rendering of the city of New Orleans and alternates perky jazz moods with bluesy interludes. It’s about eight minutes of evocative urban picaresque. George Gershwin could be seen as America’s Mozart—extravagantly gifted and dying at an agonizingly young age (both of them in their thirties). In his short life, he refashioned the relationship between jazz and classical music, and wrote some of the nation’s most unforgettable songs. He yearned for more European polish, however, and is said to have tried to study with Ravel, who turned him down, telling him, “Why should you want to be a second-rate Ravel when you are already a first-rate Gershwin?” (The same story was told about Stravinsky, which renders both possible anecdotes apocryphal.) Gershwin’s Three Preludes show his dazzling piano style at its best. They were first performed, by the composer, in 1926, two years after the Rhapsody in Blue had brought him world fame, and a year after the equally astonishing but less well known Concerto in F. The first of the preludes is the showiest, a bold and flashy piece full of striking effects—octave leaps, swift runs, and crossed-hands attacks; it must have startled its first audience. The second prelude, which the composer saw as a “blues lullaby,” is just that—a haunting tune above a bluesy accompaniment, with a faster middle section. The third, which Gershwin saw as having a Spanish flavor, does not strike the listener that way: It is a brilliant, fleet vision that seems like a heady mix of jazz and Chopin. Apparently Gershwin had originally intended a dozen Preludes; judging by these, we can only mourn their absence. Francis Poulenc’s inimitable sonic mixture of insouciant gaiety and flashes of melancholy and pathos made him the quintessential twentieth-century French composer. Someone described him as being a cross between “a monk and a guttersnipe,” and there are certainly elements of both in his music. The Sextet, scored for wind quintet and piano, was composed in 1932 and extensively revised just before the outbreak of World War Two in 1939. The work is quite rightly seen as one of his iconic works. It is exquisitely orchestrated, such that each of the wind instruments emerges as an individual character, yet never fails to subside into a euphonious body of sound, with the piano striking a note of additional color; in fact, the piano is constantly in the picture, sometimes unobtrusively so. The piece opens with a toccata-like flourish strongly akin to Stravinsky, then segues into one of Poulenc’s typically jaunty tunes. The bassoon interrupts with some somber flourishes before the music slides into a bluesy tune that is played by each instrument in turn. The second movement, marked Divertissement—Andantino was seen by the composer as a portrait of himself as a typical Frenchman, relaxed and carefree. It begins with a theme from the oboe and ends similarly, but in between is a combination of pastoral feeling, rhythmic vitality, and occasional flashes of melancholy. The finale, marked Prestissimo, doesn’t sound like that. It is, rather, a struggle between the twin elements in Poulenc’s personality: moments that belong in the music hall alternate with hymn-like chorales. The struggle ends with concluding bars that sound like intense joy hard won.